Thomas started his Tour preparations later than for last year's win and said in February he would miss May's Giro d'Italia to be "in the best shape possible" for July's Tour. "I'd love to win it again, but I'm not going to be thinking 'I need to win'," said the Welshman, 32. "I'm not far off what shape I was in last year. I know what I've got to do." 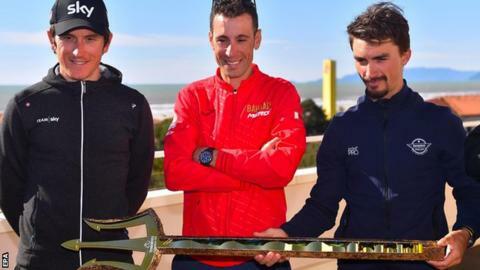 After becoming just the third Briton to win the Tour - after Chris Froome and Bradley Wiggins - Thomas started winter training towards the end of November, three weeks later than the previous year. "I feel like I really needed that," he told the BeSpoke podcast. "I've had a bit of a lack of racing but I'm improving all the time. "Romandie wasn't the best time for me last year but that's what gave me the kick up the backside to knuckle down from there on and really push towards the Tour. "I'm trying to get there in the best shape I can, purely because I won it last year, otherwise I might have looked to the Giro." Thomas expects four-time winner Froome to be one of his closet rivals at this year's Tour, along with their Team Sky team-mate Egan Bernal. "I feel like there's less pressure because I've done everything I ever wanted to do," Thomas added. "It doesn't mean I'm less motivated, I just don't feel I've got anything to prove. "I'm still determined as ever to win it again but if I don't then hopefully Froomey or Egan does. That whole thing will be played out on the road, as it was last year. "I feel like, in every interview I do, people are talking about me and Froomey and who's going to win, but there's a lot of other good riders out there who are performing well at the moment."